This year, St. Albans got its first craft brewery, 14th Star Brewing. It was only a matter of time before the Railroad City had a gastropub to match. 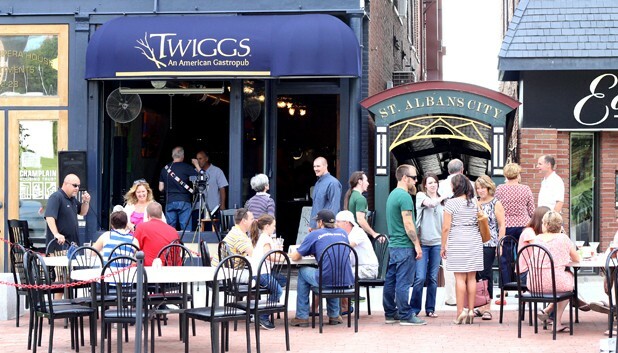 Twiggs — An American Gastropub opened last Friday. That opening meant a farewell to a longtime favorite. Twiggs replaces Chow! Bella, which St. Albans businessman Tom Murphy purchased from original chef-owner Connie Warden two years ago. Murphy says taking over his favorite restaurant was “like living a dream,” but he soon realized that diners weren’t seeking the fare popular a decade ago. After wrestling with the decision and working with consultants such as A Single Pebble founder Steve Bogart, Murphy decided it was time to open a more casual restaurant where locals could eat weekly, not just on special occasions. He recruited his sister, Kristin Murphy, a California-based chef and manager, to assist chef Jeremy Boutin in creating a menu of upscale pub food. 14th Star Brewing’s product figures prominently in Twiggs’ signature cheese sauce, as well as in the beer batter that coats chicken tenders and fish and chips. Suds-free items on the extensive menu include salads, burgers, a variety of grilled-cheese sandwiches and a deep-dish cookie called the Ultimate Twiggie. Diners can enjoy them outside, where Murphy says the food and live music are already attracting a vibrant scene. The original print version of this article was headlined "Ciao, Bella!"